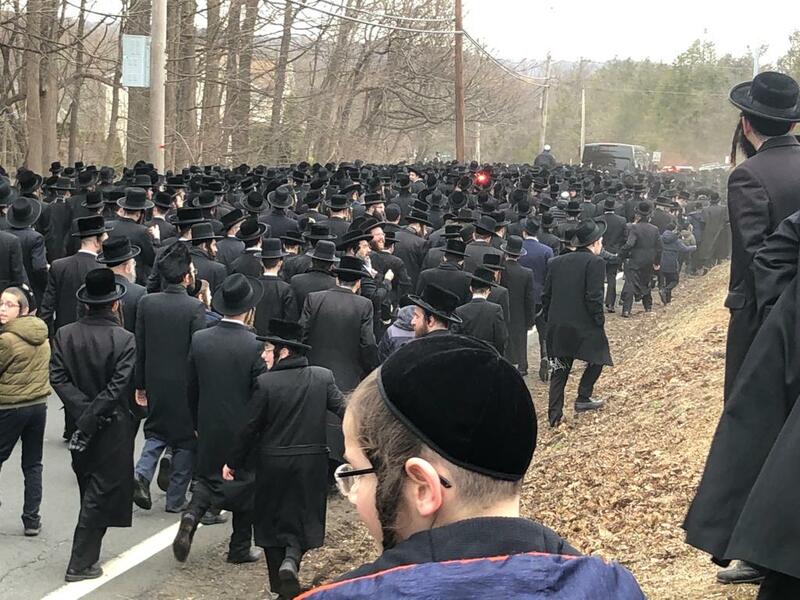 Rockland County, NY - A crowd of thousands stretching a mile long turned out this afternoon in Monsey to pay a final tribute to the Skulener Rebbe, Rabbi Yisroel Avraham Portugal, who was laid to rest in the Vizhnitz cemetery on Route 306. A massive funeral held in Brooklyn for the Skulener Rebbe earlier in the day was estimated to have drawn tens of thousands of mourners. Monsey area law enforcement was well prepared for the funeral, with members of the Ramapo Police Department gathering near the cemetery by 1 PM and New York State Police cruisers stationed at virtually every intersection along the route to be traveled by the crowds during the funeral. 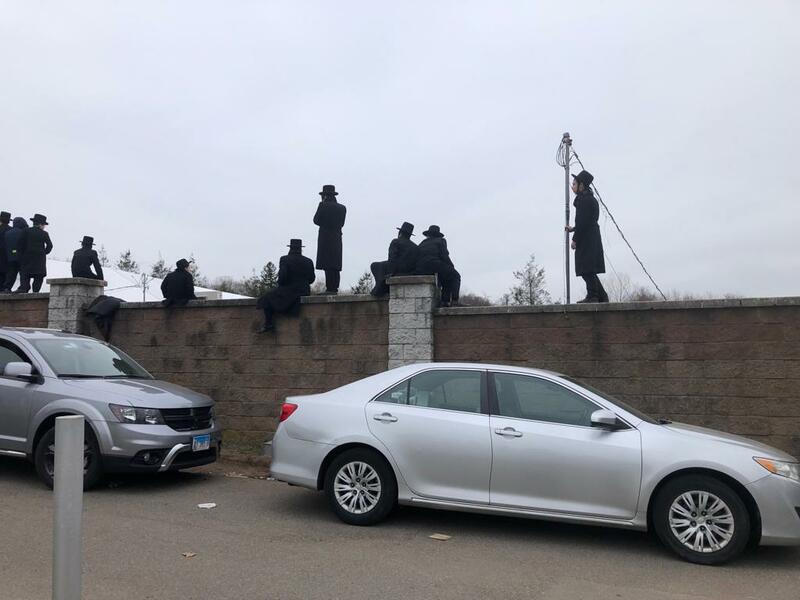 A robocall made by the Spring Valley Police Department advised local residents in both English and Yiddish to expect heavy traffic and road closures and to watch out for pedestrians, especially children, during the funeral. Several schools dismissed students early so that they could participate in the funeral, as did multiple local businesses. By 2 PM cars had already begun arriving at Palisades Credit Union Park, where school busses transported people to the frozen zone in the Blueberry Hill neighborhood for the funeral at the Skulener Beis Medrash. Thousands of people packed the small streets where both barricades and loudspeakers hand been set up to accommodate the crowd, the sound audible a mile away at the Vizhnitz cemetery where police were ushering VIP guests through a side entrance while directing all others to the main entrance. As the funeral ended at approximately 4 PM, mourners walked alongside the van carrying the body of the Skulener Rebbe to its final resting place, transforming Route 306 into a seemingly endless sea of black that stretched for blocks. Law enforcement lined the funeral route as roads were closed down, with police and state troopers joined by mounted officers from the Rockland County Sheriff’s Department as well as volunteers from Hatzolah, Chaverim of Rockland and Chaverim of Kiryas Joel. Mourners packed the cemetery, jostling to get as close as possible to the Skulener Ohel. As drones hovered overhead, some took a moment to pray at the grave of a loved one or any of several holy rabbis who are buried in the same cemetery. The walls of the cemetery were dotted with men and boys who had scaled their heights in order to catch a glimpse of the burial, while others perched themselves atop fences or cars. The Skulener Rebbe was laid to rest next to his father, Rabbi Eliezer Zusia Portugal. Just wondering, why did Viznitz have the Zechiya to have so many of the latest tzadikim in their cemetery? What's with Kiryas Joel and New Square?